Imagine an elderly neighbor who begins attacking you because you won’t go out with him. He abuses and maliciously wounds the one creature that means the most to you, your horse. Imagine the sheriff’s office refuses to help you after repeated calls when they know who your abuser is, but they are retaliating against you so they do nothing. You have no police protection. Imagine you rush your badly injured horse to the veterinarians you have used for fourteen years, but they just pretend to treat him because they believe you should lose your pet, and he suffers for months and dies because of them. What are you guilty of? You rescued two sick dogs and stood up to bullying deputies, one of whom threatened to arrest you or shoot you. This is Harvey’s story. On September 20, 2013, a day which brought five inches of rain, I arrived home from work and Harvey was not waiting at the gate as he always did. I felt in my heart something was horribly wrong. I frantically ran around trying to find him, calling for him. He didn’t respond and for several minutes I thought the worst. Finally, Harvey’s mother whinnied to him and he responded. That gave me the direction to look and I found him. 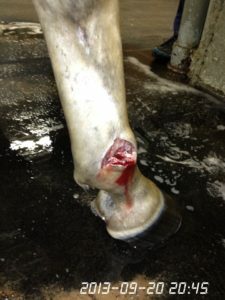 He had been mutilated with a huge gash across his fetlock. He was soaking wet and couldn’t walk. He had waited for eight hours in that rain for me to come home and save him. Two days later, an ugly neighbor I had refused to go out with drove by and saw me in my front yard. He slowed down, rolled down his window, and yelled HA HA HA HA! I managed to get Harvey loaded and to Bastrop Veterinary Hospital where veterinarians there, through their mistreatment, delay, negligence and gross negligence, tortured Harvey for more than two months. Harvey ended up at A&M where they tried everything to save him, but the injuries inflicted by his own veterinarians were too great. Harvey’s initial injury was survivable, but the injuries inflicted by his former veterinarians were not. Harvey had a deep gash across his fetlock joint. I did not know at the time how dangerous that was, but those veterinarians did. They stitched him up and sent us home with SMP tablets. For the next two plus months that’s all they did. As Harvey grew worse, they gave him Banamine or Bute for pain and inflammation. They gave him SMP tablets for two months (not standard either, SMP should not be given for more than 30 days because if it doesn’t work in 30 days something different needs to be tried), but it wasn’t helping and they knew that. As Harvey grew lame, I went online to investigate the possibilities of what was wrong. Everything pointed to a joint infection, but when I asked if he had a joint infection, Lucy Pustejovsky told me he didn’t have a joint infection even though she had done none of the required protocols to determine if he had a joint infection. In fact, there are very few things other than a joint infection that will make a horse as lame as Harvey was. Lucy Pustejovsky repeatedly told me he did not have a joint infection, when in fact he did. I also learned this is Vet School 101 and they all know the procedures for a deep gash over a joint. It’s a well-known veterinary equine emergency. There is a set of protocols the vets are supposed to follow. They never tested Harvey to see if the joint was involved, and any veterinarian would have known to do that with a gash this deep and knowing, as they did, that the wound was hours old and had dirty rain water washing over it during those hours. This is how lame Harvey became before he was finally referred to A&M. I am also attaching the A&M veterinarian’s write up describing Harvey’s condition when I took him on December 4, 2013. He was finally referred on December 3, 2013. Dr. Watts states he was 4.0 to 4.5 lame and had a severe joint infection (98% neutrofils). In both Lucy Pustejovsky’s clinic notes and in her deposition, she states Harvey was Grade 3 lame – that is blatantly false. An additional risk of leaving a lame horse lame for any length of time is laminitis, which all veterinarians know. Recall the story of Barbaro, the racehorse whose broken leg was repaired but he died because of laminitis in his other legs. Harvey had successful arthrodesis surgery at A&M, but he foundered on the off leg because of the length of time he had to hold his weight on that leg. What kind of veterinarians would treat a horse the way Harvey was treated? Not the kind of veterinarians who should keep a license to practice. Harvey suffered horribly before he was euthanized seven months later. 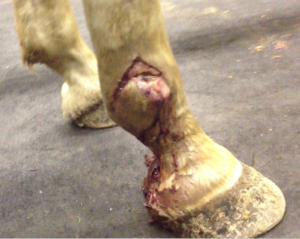 The photo of Harvey’s initial injury is attached with a graphic warning. 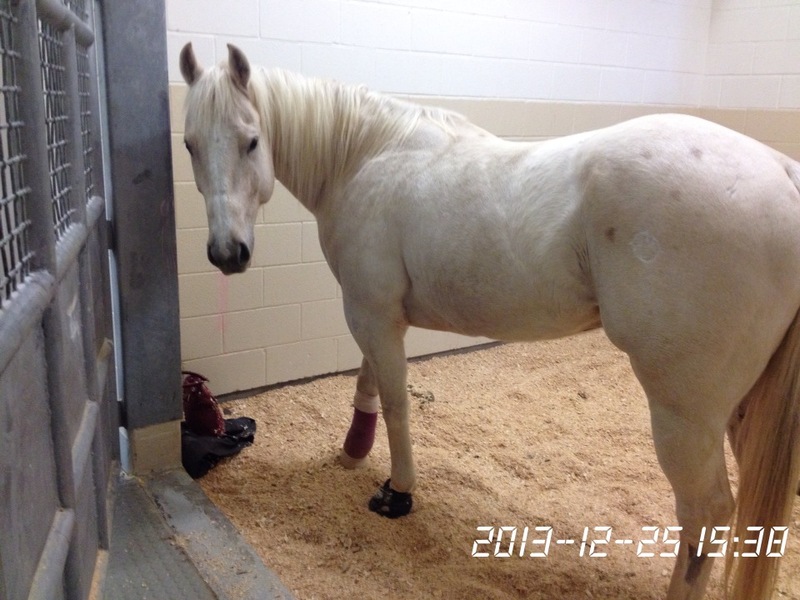 The complaints to the Texas Board of Veterinary Medical Examiners, also have graphic photos. I am also posting the entire deposition of Lucy Pustejovsky, where she admits knowing what should have been done for Harvey, but admits she didn’t do any of it nor did any of the other veterinarians there. I am posting photos of my beloved Harvey at A&M where he stayed for months. I drove to A&M every evening to see him and Harvey would hear me coming. He would whinny as I walked up the hallway toward him. When I had to leave him, he would pin his ears to show his unhappiness. He just wanted to come home. I wanted that, too, so very badly. I wanted that magnificent horse to run through his pasture again with his head and tail up and roll in the sand, and scratch his mother while being scratched back by her. I wanted him to wait for me at the gate like he always did. I wanted the joy and beauty of him in my life. I wanted that happy, healthy horse nuzzling me again. I filed a lawsuit against those veterinarians. The deposition is also on this website. The case has settled. On May 3, 2016 I filed the complaints (they stamped them May 5, 2016 for some reason). Veterinarians have a license to torture animals. They are exempt from criminal charges. The only price these veterinarians may pay for what they did to Harvey will come from any action taken by the Texas Board of Veterinary Medical Examiners. I hope you will read the complaint and the deposition and be outraged enough to write or email the Board in support of justice for Harvey and the revocation of the licenses of the veterinarians responsible. Their contact information is at the end of this document. The Bastrop County Sheriff’s office did nothing to Harvey’s attackers despite my repeated pleas for help. When I posted a reward for information, Harvey’s mother, Rachel, was attacked a week after that (January, 2015), forced into a barbed wire fence the same way Harvey was. I had to move her to safety and could not keep her at my home. Fifteen months after Harvey’s death, I moved away from Bastrop County, leaving Harvey’s grave where I had cried a million tears. I still cry a lot these days. I cry when I see a horse trailer because it can’t be mine with Harvey in it. I wake up crying at night because of the horror of it all, the horrendous torture and loss of Harvey and the loss of my faith in human beings, and veterinarians, and law enforcement. Every day I tell Harvey how sorry I am for taking him to those veterinarians and not figuring it out soon enough to save him. I’m struggling through my days. This is not something you recover from. I feel it’s very unlikely that five veterinarians got that easy diagnosis wrong. I have written an article about what happened entitled The Price of Bullying By Law Enforcement. It sets out the series of events that led up to Harvey’s torture and death. Also attached is an article I wrote called Rescue, which describes the only disagreement, if it can even be called that, I ever had with any of these veterinarians – until they tortured my beloved Harvey to death. If you are a veterinary technician and have information you can provide regarding Harvey’s torture, please contact the Texas Board of Veterinary Medical Examiners’ Investigator, Rebecca Anderson, at Rebecca@veterinary.texas.gov or by phone to 512-305-7565. In memory of Harvey. I miss you with every breath I take. Please support all efforts to make veterinary oversight boards fair, to make courts recognize the sentient value of our beloved pets, and to make veterinarians subject to criminal charges when they torture animals.